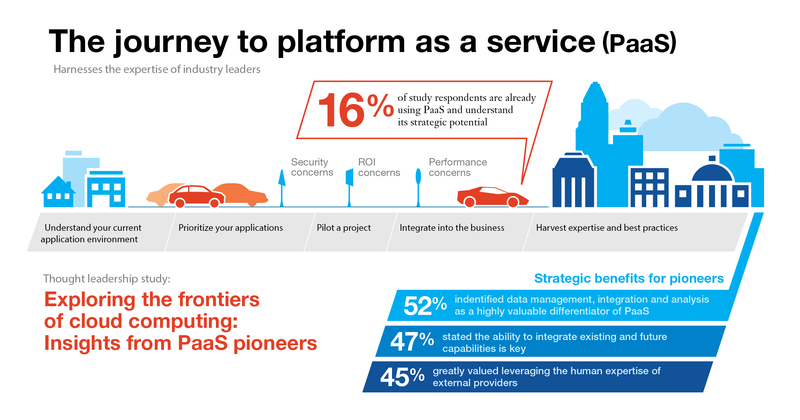 Platform as a Service (PaaS) is a special type of service model in cloud computing. PaaS can be imagined as s a link between traditional infrastructure services (Infrastructure as a Service, IaaS) and application in the cloud (Software as a Service, SaaS). In this article, we will highlight how Platform as a Service (PaaS) can help the developers in Big Data & Software Development arena. In PaaS, cloud providers provide customers a ready to use platform to develop, operate and manage their applications without the need of worry about the sysadmin works needed for infrastructure, which differentiates from cloud server, VPS (they are Infrastructure as a Service, IaaS). Use cases of cloud server, VPS, dedicated server is different. In paid tier, Platform as a Service (PaaS) probably not cost-effective or efficient for ordinary web hosting. Usually commonly known PaaS is delivered as public cloud. It is also possible to use PaaS in private cloud and hybrid cloud scenarios. In case of Public Cloud, the cloud provider provides all the essential IT components needed to host applications on PaaS. These include servers, storage systems, network operating systems and databases. In a private cloud model, vendors deliver PaaS in the form of an appliance running inside customer’s firewall. In sch case, PaaS stack runs in the user’s data center. In case of Hybrid cloud, the PaaS customers use both public and private cloud services for their software development. Within PaaS service, individual developers and organizations can create an IT environment where they can create and run new applications without investing time and money in infrastructure. Applications can be developed and deployed faster – an important aspect to gain competitive advantage or publish new software or plugin. Platform as a Service fits well with the demand for a more agile IT, which is set in many initiatives for digital transformation. Developers can use PaaS to test new programming languages or databases without having to procure the infrastructure each time. When it comes to new development techniques or tools, a PaaS environment also makes the upgrade process easier. Last but not least, PaaS forces developers to use current cloud technologies in their applications and to efficiently use the associated infrastructure (IaaS). Switching to agile development methods is often easier with a PaaS environment. Today, we have technologies like Apache OpenWhisk, which are often referred as Serverless Computing, or Function as a Service. As most of the PaaS providers like IBM uses F/OSS technologies (excluding IBM’s some proprietary service like Watson), Serverless Computing also F/OSS, there is no actual vendor-lock-in in the cloud. In this scenario, we have microservices for cloud native applications. Obviously, big data analytics is a special niche, in our many previous articles we discussed vendor specific situations in details like Building Big Data Analytics Solutions In The Cloud With Tools From IBM. Hadoop, Spark essentially becomes PaaS in such cases. There are many other proprietary tools and resources offered by vendors, the guides and tutorials offered by various vendors in general helpful to offer ideas. Deep learning, artificial intelligence are interesting but not easy to deploy on own servers just for testing even if F/OSS software used. TJBot essentially developed by a research worker, not exactly employee. It is F/OSS project and a funny but nice example of combining ideas and technologies. PaaS also can work as news center – Heroku cloud used to offer various tools to developers at free or lower price, like SendGrid. With time, unfortunately Heroku killed own self. Without a minimum free monthly quota, it is difficult for the technology bloggers to give examples to the relatively new. The reason to mention IBM Cloud (previously IBM BlueMix) at present is the free usage quota without odd troubles. Developing and testing applications is one of the most common uses of PaaS. But in practice, there are a number of other scenarios. Companies can use PaaS to develop, operate, secure, and manage application programming interfaces (APIs) and microservices. Of course, writing new APIs as well as the extension of existing APIs with additional interfaces is another work. End-to-end API management can also be set up in a PaaS environment. Tools available through PaaS allow to analyze their data and recognize patterns. They can make more informed decisions and make more accurate predictions about the demand for specific products. A PaaS environment often also provides access to a BPM platform that is offered with other cloud services. BPM Suites integrate multiple IT components that business organizations need. These include, for example, service-level agreements (SLA). Telecom segment can use PaaS to deploy communications platforms. This gives developers a way to provide their applications with communication features such as voice, video or messaging in a relatively easy way. PaaS providers also offer services which enable the developers to set up and maintain a database. This is a scalable and secure self-service platform which automates both the provisioning and administration of databases. Such platforms could be used not only by IT experts, but also by users from specialist departments. Internet of Things (IoT) is one of the areas of PaaS which analysts expect to particularly see strong growth in the upcoming years. TJBot is an easy example of IoT. Relevant offerings already provide a wide range of application environments, programming languages ​​and tools for the diverse IoT scenarios of enterprises. Needless to say, there are complex matters like Master Data Management (MDM) for governance of processes, policies, standards, and tools which specialized persons of organizations need to use. Platform as a Service includes a number of basic cloud infrastructure components, including servers, networking equipment, operating systems, storage, and middleware. As a rule, these are the property of the service provider who also operates the systems. At a higher level, additional resources are added, such as development tools, programming languages, libraries, database management systems, and container techniques such as Docker and Kubernetes. It is no coincidence that many PaaS providers are also providers of software development tools. There are around 200 PaaS providers in the market. Among them, IBM, RedHat OpenShift, Amazon Web Services, Microsoft, IBM and Salesforce are leading and has community support in common Q&A websites like StackExchange. Unfortunately, PaaS no longer is safe from the hackers – PaaS has separate DDoS protection services to save from attacks. As with other cloud offerings, some risks is obvious on PaaS. These include primarily safety aspects. PaaS is also based on the principle of shared resources, such as servers or networks, to which attackers can gain access. On the other hand, the experience of recent years shows that the major cloud providers are generally better armed against security attacks than an average corporate data center. Many cloud skeptics concerns about information security have proven exaggerated or unjustified. Because companies tie closely to the infrastructure of a provider with PaaS, there is a general risk of dependency. That aspect of interchangeability we discussed above mentioning vendor-lock-in. Also by using container virtualization, this problem becomes diluted and becomes easier to port. Of course, none expects top-notch data security on PaaS unlike own datacenter without any connection to outside world – we are talking about development purpose only. This Article Has Been Shared 7765 Times! Here is a Brief Getting Started with Microservices Article in Plain English for the Readers Who are Not Sure What Microservices are. Cite this article as: Abhishek Ghosh, "How PaaS Can Help Developers in Big Data & Software Development," in The Customize Windows, June 7, 2018, April 21, 2019, https://thecustomizewindows.com/2018/06/how-paas-can-help-developers-in-big-data-software-development/.